So if your experience with sprouts is a miserable childhood memory of being forced to eat them boiled until they are grey, please just give them another go. The absolutely best way to eat them is when they are blackened, either by frying or roasting. 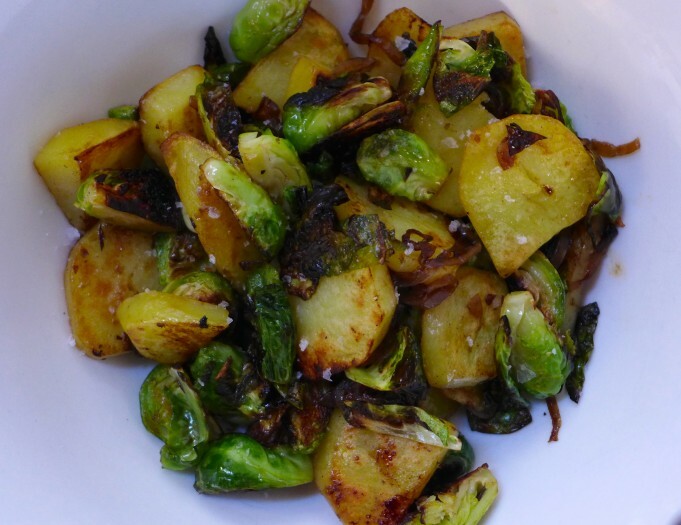 Brussels sprouts haters, I’m hoping this dish may convert you. This is one of my favourite dishes when I want a quick satisfying meal. It is easy to prep and only contains two (or three) ingredients not counting the oil and salt, but I think it is much more than the sum of its parts. There are delicious caramelised flavours and contrasting textures between the soft potato, the still slightly dense bite of the sprouts and the completely crispy bits of sprout leaves that have separated. I love it with just the potatoes and sprouts, but it is extra special with some caramelised onions added just before serving. Peel and cut the potatoes into ½ cm thick slices. Steam or boil the potatoes for 5 minutes or until they are just tender but not completely cooked. Drain the potatoes. Trim the bottom of the sprouts and cut into quarters. Add half the oil to a hot pan and add the sprouts and toss so they get browned or even blackened on most sides. Add ¼ cup of water to steam the sprouts a bit. Cook until the water evaporates away. Add the remaining oil and the potato slices. Cook over a medium heat until the potatoes are browned and the sprouts are cooked. They are great as is, but a spoon of caramelised onions will lift it even further.